Shoosh Lettick Crotzer has a BA in Psychology from UCLA, an MS in Diagnostic Education from Florida International University, and has taken classes toward a doctorate in Therapeutic Exercise. 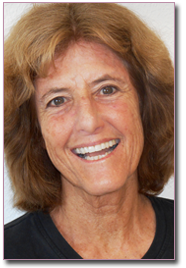 She has also been a yoga therapist and instructor for more than 40 years. Shoosh taught yoga at UCLA and in 1988 made her first video, called Continuing Yoga, at Home with Shoosh, which is still popular with her students. In 1990 she began working with the National Multiple Sclerosis Society and created a yoga-based exercise program for MS clients, and was asked to make it into a video. She formed her own company, called Mobility Limited in 1994, and produced Yoga for MS and Related Conditions (now titled Yoga for MS) that has received wide recognition and is still used internationally. In 1996, she wrote and produced Yoga for Arthritis in partnership with the Arthritis Foundation; the Spanish version was finished in 1997. This DVD has been used in hospitals and homes all over this and Spanish-speaking countries. In 2008, Shoosh wrote Yoga for Fibromyalgia: Move Breathe and Relax to Improve Your Quality of Life for Rodmell Press and she is presently working on her next book, a yoga handbook for breast cancer survivors. In 1998, Shoosh founded and was the Executive Director of the nonprofit organization, Enhancement, Inc. until its closure in 2012. Among her jobs was the creation and management of seminars and presentations on lymphedema. This was the seed for Lymphedema Seminars. Shoosh lives in Morro Bay, CA with her husband and has 7 incredible grandchildren! To learn more about Shoosh's yoga background, her classes, videos, etc. visit www.yogawithshoosh.com. © 2017 Lymphedema Seminars. All Rights Reserved.